I remember exactly where I was the first time I saw a Triumph Thruxton in person. It was January of 2005 and I was on winter break from college. My dad and I were out for a Saturday afternoon drive in his old Dodge pickup to look at motorcycles, and the last stop of the day was at Hermy’s Triumph and BMW in Port Clinton, Pa. The brand-new 2005 Triumph models had just been unloaded from their crates and the chrome gleamed from the far corner of the showroom. There sat the Triumph Thruxton, its unmistakable lines paying tribute to the past and captivating riders then as it does today. Originally released in 2004, the Triumph Thruxton greeted the '05 model year wearing a brand new Racing Yellow paint scheme, complete with a checkered flag strip down the middle. Having never ridden a motorcycle before, the Thruxton scared the hell out of me, even sitting still. It was the "Black Sheep" of Triumph’s lineup, like your cousin who comes home from college and introduces you to cheap beer, cigarettes, and heavy metal music. Everyone wants to be that smooth, but few manage to pull it off. I was more like the guy who gets caught trying to buy cheap beer with a fake ID. I was not smooth. The 2005 Thruxton wore "Racing Yellow" paint. In 2012, I had a chance to ride a race-prepped version in the same color scheme. Photo by Spurgeon Dunbar. That same year, I ended up buying a black-and-white Bonneville T-100. “It’s a better bike for a new rider like yourself,” the sales manager told me, and I half-heartedly agreed, while silently vowing to myself that one day I would be cool enough for a Thruxton. Almost a decade later, I still haven’t gained much in the "coolness" department (just ask Lemmy), but I have greatly improved my skills as a motorcyclist. Over these past 10 years, I have had the opportunity to ride quite a few different Thruxtons, including the original carbureted version, a Thruxton Cup race bike down at Barber Motorsports Park in Alabama, a fully customized Thruxton done up by the good folks at British Customs, and most recently for RevZilla, a bone-stock 2014 model. While the classic lines of a vintage cafe racer remain unchanged, the Thruxton has seen some mechanical advancements throughout the years. A bone-stock 2014 Thruxton. The lines are almost exactly the same as in 2004. Photo by Spurgeon Dunbar. When the Thruxton was introduced, it was the first model in Triumph’s Modern Classics lineup to get the upgraded 865 cc parallel-twin engine. 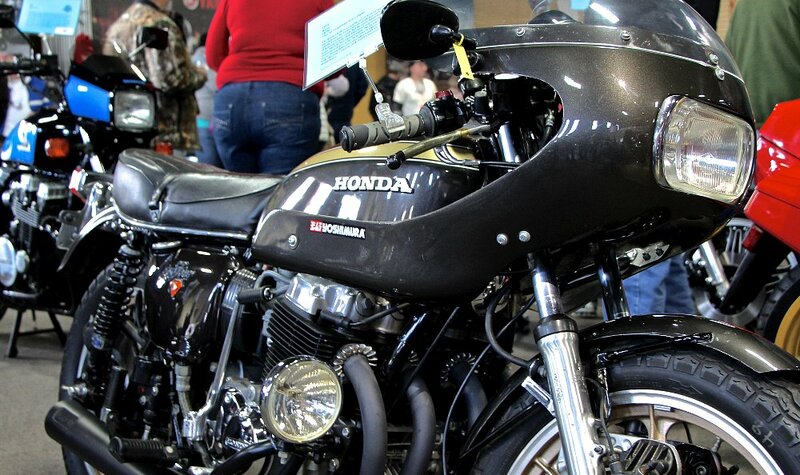 It featured clip-on handlebars and rearset controls that tucked the rider into a natural crouch. A rear seat cowl gave the bike the appearance of being exclusive to one rider, but it was easily removed to allow a passenger to come along for the ride. Front and rear suspension were both adjustable for pre-load, and the 18-inch front wheel was a compromise between the performance of a 17-inch rim and the classic styling of a 19. This setup does require you to use a bit of your weight to wrestle the ol' gal through the corners. At six feet, three inches, and 215 pounds, I have no shortage of weight to throw around, and I found the handling to be even-keeled and predictable. Throughout the years, that 865 cc heartbeat has been a constant, pumping out about 69 ponies at the crankshaft. When Triumph upgraded the Thruxton from carburetors to fuel injectors in 2009 to meet increasingly stringent emissions regulations, the redline was bumped from 7,500 rpm to 8,500 rpm. This was accomplished with a slightly redesigned cam profile and reprogrammed ECU and rev limiter. With this change, the maximum torque output dropped about two foot-pounds and arrived a little higher in the rpm range. The Thruxton is a time machine, taking me down the back roads of my youth. Photo by Brett Walling. The benefit was that it eliminated a bit of the desire to shift up into a phantom sixth gear that doesn’t exist. If you have ever ridden one of the old carbureted versions, you will remember feeling the ever-present need to try to shift up out of fifth gear and into sixth at highway speeds. With the new model, I rode it through the corners all day in third and fourth gears with the engine comfortably turning about 5,500 rpm. Overall the Thruxton pulls hard from 4,000 rpm on up and has enough power to keep you smiling as you burn up back roads. In addition to the changes in fueling and engine dynamics, 2009 brought about the most significant changes to the Thruxton line to date. Gone were the original 7/8-inch clip-ons, replaced by a low-slung, one-inch bar with a standard setup. This provided more comfort on longer rides while still maintaining the stance and style of the original bike. While the Thruxton is never going to be my go-to touring machine, I was able to comfortably log 300 miles a day without aches or pains. The new handlebar on the post-2009 models improves comfort for all-day rides. Tank bag optional. Photo by Spurgeon Dunbar. The tank increased in size (but not fuel capacity) to accommodate the fuel pump needed to feed the injectors and the standard Mickey Mouse mirrors were replaced by an adjustable bar-end setup. While this made the bike look better, it did nothing to improve the rider's hindsight vision, as the mirrors vibrated horribly. Add this to the list of modifications you should keep on your short list of upgrades. My biggest complaint with the new Thruxton is the fueling. Like I mentioned earlier, I had the opportunity to ride a few tuned-up versions of the Thruxton, including one prepped for the Thruxton Cup, a spec racing series. After riding a professionally tuned version, the stock version just feels strangled. A new exhaust system and a reflash of the ECU to improve fueling should top your list of modifications. Aesthetics, not the mechanicals, are the driving force that sets the Thruxton apart from others. Whether you are buying it to supplement that finicky vintage machine in your garage, thus giving yourself something more reliable for day-to-day use, or making it the only steed in your stable, the Thruxton has the looks that kill. Classic lines on the back roads of America. Photo by Spurgeon Dunbar. 2015 marks a new decade for the Thruxton. It continues to resonate with riders who want a motorcycle with classic lines, but want to retain the reliability of modern technology. It serves as a blank slate for those who want to learn how to wrench on a motorcycle, but may be a bit intimidated at the prospect of restoring a vintage machine right out of the gate. I can relate. I was that guy. Through their owners' imaginations and aftermarket parts, Thruxtons have also been a blank slate for customizing. I hope Triumph keeps this bike around, unmolested, for another 10 years, allowing riders to continue to learn on it and make it their own. The heavily modified British Customs Thruxton on the right has a 21-inch front wheel and wide rear wheel. The bike looked great. The handling was another story. Photo by Spurgeon Dunbar. I may not be as cool as I hoped I would be after a decade of riding, but I can only imagine where I would be without motorcycles in my life and what they have taught me. I work for a rad young motorsports company, I am rebuilding two vintage bikes in my garage, and I can ride the bikes I own better than ever before. The Thruxton is part of what helped me grow into the rider I wanted to be, 10 years ago when I first saw one on the dealership floor and vowed I'd someday ride it.